There are several reports that indicate a linkage between exposure to power frequency (50 – 60 Hz) magnetic fields with abnormalities in the early embryonic development of the chicken. The present study was designed to understand whether power frequency electromagnetic fields could act as an environmental insult and invoke any neurochemical or toxicological changes in developing chick embryo model. Fertilized chicken eggs were subjected to continuous exposure to magnetic fields (50 Hz) of varying intensities (5, 50 or 100 μT) for a period of up to 15 days. The embryos were taken out of the eggs on day 5, day 10 and day 15. Neurochemical (norepinephrine and 5-hydroxytryptamine) and amino acid (tyrosine, glutamine and tryptophan) contents were measured, along with an assay of the enzyme glutamine synthetase in the brain. Preliminary toxicological investigations were carried out based on aminotransferases (AST and ALT) and lactate dehydrogenase activities in the whole embryo as well as in the liver. 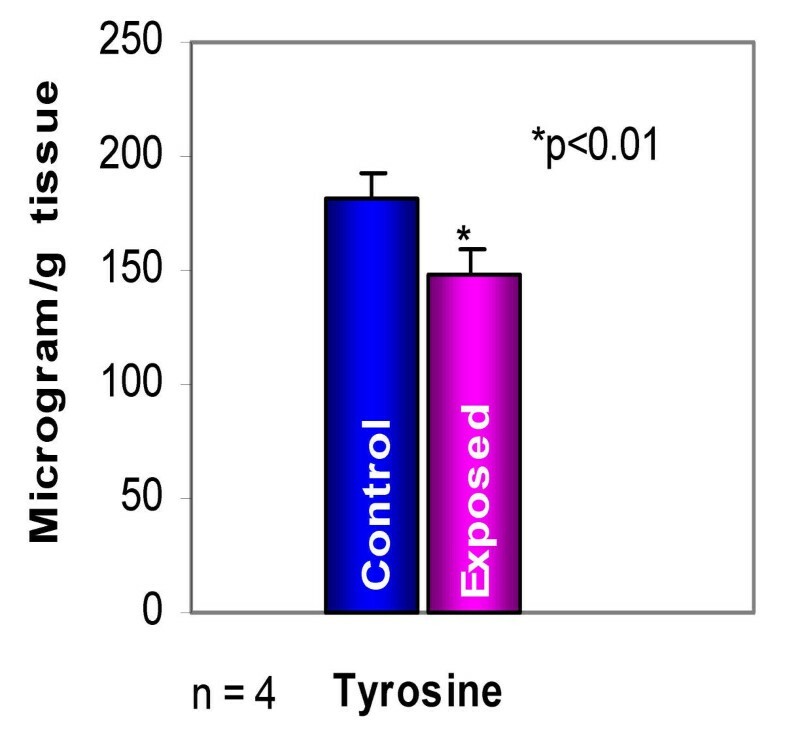 The study revealed that there was a significant increase (p < 0.01 and p < 0.001) in the level of norepinephrine accompanied by a significant decrease (p < 0.01 and p < 0.001) in the tyrosine content in the brain on day 15 following exposure to 5, 50 and 100 μT magnetic fields. There was a significant increase (p < 0.001) in glutamine synthetase activity resulting in the significantly enhanced (p < 0.001) level of glutamine in the brain on day 15 (for 100 μT only). The possible mechanisms for these alterations are discussed. Further, magnetic fields had no effect on the levels of tryptophan and 5-hydroxytryptamine in the brain. Similarly, there was no effect on the activity of either aminotransferases or lactate dehydrogenase in the whole embryo or liver due to magnetic field exposure. Based on these studies we conclude that magnetic field-induced changes in norepinephrine levels might help explain alterations in the circadian rhythm, observed during magnetic field stress. Also, the enhanced level of glutamine can act as a contributing factor for developmental abnormalities. The effects of power frequency magnetic fields (50 Hz) on in utero development of embryos are of much greater consequence than transiently-reduced fertility. The possibility that induced electric fields and current might affect cellular proliferation and differentiation in the developing embryo and foetus has been examined in a number of studies. Concern has been expressed about the possible adverse effects of occupational exposure to electromagnetic fields on the development of the embryo and foetus, particularly by operators of Visual Display Units (VDU), and by staff operating clinical magnetic resonance diagnostic systems. However, the evidence for any adverse effects on pregnancy outcome, derived from epidemiological studies is equivocal . It has been shown that there are abnormal embryological changes in chick embryos following exposure to weak (1 μT) pulsed or sinusoidal magnetic fields of up to 100 kHz [2–7]; however, other investigators have not been able to replicate the magnetic field sensitivity of developing chick embryos to weak electromagnetic fields [8–10]. As a result of these contradictory reports the controversy over the effects of magnetic fields on developing chick embryos still continues. The use of chick embryo as a biological system has certain methodological advantages over the utilization of other upper vertebrates. Because the chick is an amniote vertebrate, its early embryogenesis involves developmental processes that are equivalent to those occurring in mammals, but takes place at higher rate. Moreover, as an oviparous organism, any response of the chick embryo to an external agent, such as magnetic field, would be attributable to a direct interaction of the magnetic stimulus with the embryonic development process and not an influence of the field on the maternal organism . In this context we have conducted a study on the effect of 50 Hz magnetic fields on developing chick embryo. The main objective of the study was to understand any toxicological or neurochemical alterations influenced by a magnetic field, since embryo growth and development is mainly controlled by genetic and environmental factors. Studies of the birth weight of relatives, together with animal cross breeding experiments have led to the conclusion that diversity is essentially determined by the intrauterine environments and that genetic factors play a relatively weak role . The studies were conducted under three varying magnetic field intensities (5, 50 and 100 μT). The magnetic field intensities were selected based on the national survey of magnetic field exposure at different locations (Unpublished data) conducted by Central Power Research Institute, Hyderabad, Ministry of Power, Government of India. Tryptophan, tyrosine, norepinephrine, 5-hydroxytryptamine and O-phthalaldehyde were from Sigma, (St. Louis, USA). Dibutylamine and sodium octyl sulphonate were purchased from Fluka, (Neu-Ulm, Switzerland) and Lancaster, (Morecamble, England), respectively. All solvents used were of HPLC grade procured from E. Merck (India) Limited, (Mumbai, India). All other reagents were analytical grade. A square-shaped Helmholtz coil, producing an alternating current (AC) magnetic field (50 Hz) proportional to the electric current in the coil, was wound over a wooden frame of dimension 25 × 25 × 25 cm3 (l × b × h), suitable for placement inside an incubator (Binder, Tuttlingen, Germany). Electric current through the coil was regulated as explained below. Since the magnetic field exposure is a continuous process, an uninterrupted power supply (UPS) was used in order to avoid the supply variation. The output voltage variation of the UPS was limited to less than 1% ensuring stable magnetic field generation. Supply voltage can produce electric field also inside the incubator. If the supply voltage is higher, electric fields produced will also be higher, which is not desirable while studying the biological effects of magnetic fields. To reduce the presence of electric field in the exposure set up the 230 V supply voltage was stepped down to 12V/15V using a step down transformer. The resistance/impedance of the coil being constant at fixed frequencies, the current control was achieved through a variable resistance connected in series with the coil. The heating effect was taken into account by selecting higher wattage rheostats. Similarly, to reduce heating of the conductor of coil, the conductor diameter was higher to carry the necessary current. The current source (step down transformer, rheostat etc.) was shielded by means of MS sheet enclosures. The calibration of the exposure facility was carried to confirm uniform distribution of the magnetic field intensity where eggs were kept (Figure 1). Magnetic field exposure facility for developing chick embryo. The control group was placed in a regular incubator and the exposed group was exposed to varying magnetic field intensities (5 ± 0.25 μT, 50 ± 2.5 μT and 100 ± 5 μT) in the specially designed set up explained above. All the eggs were covered with sterile cotton to maintain uniform temperature (35 ± 2°C) and rotated every 3–4 hours to ensure even field exposure. At the end of 5, 10 and 15 days of incubation, the eggs (n = 4) were withdrawn from both sets and subjected to analysis. The eggs were dissected to isolate whole embryo, liver (preserved at -20°C) and brain (preserved at -70°C) for the assays detailed below. Brains, preserved at -70°C were thawed and homogenized in a solution made of 0.15 M perchloric acid containing 0.025% each of cysteine and EDTA. The homogenates were centrifuged at 12,000 g for 30 min at 4°C and the clear supernatants were used for the estimation of neurotransmitter levels by high performance liquid chromatography (HPLC) as described by Lee Chin . Aliquots (20 μl) of the clear supernatant was injected into the reverse phase C18 columns (250 mm × 4.6 mm; particle size – 5 μm) fitted on to a HPLC system (Shimadzu LC-10AT, Shimadzu RF-10AXL and Shimadzu C-R6A Chromatopac, Kyoto, Japan) equipped with a fluorescence detector system. The eluant contained an aqueous buffer and acetonitrile (181: 19, v/v). The aqueous buffer (pH 3.8) was made of citric acid (12.16 mM), diammonium hydrogen phosphate (11.6 mM), sodium octyl sulfonate (2.54 mM), dibutylamine phosphate (3.32 mM) and EDTA (1.1 mM). The eluant mixture was filtered through a 0.45 μm filter, degassed, and run at a flow rate of 1.0 ml/min for 25 min. Standard solutions of tyrosine (5 – 40 pg), norepinephrine (20–100 pg), tryptophan (20–100 pg) and serotonin (2 – 20 pg) were injected individually and as a mixture to note their retention times with their peak areas. The fluorimetric detector used was very sensitive and could detect amounts as low as 20 pg. Aliquots (20 μl) of test samples or standards were loaded onto HPLC and resolved completely within 25 min. The samples were also spiked with a mixture of standards, and the areas under the curve of the standards were subtracted from the combined areas to obtain the actual quantities of neurotransmitters present in the brain. Brains were homogenized in Tris-HCl buffer (pH 7.4) and treated with ice cold trichloroacetic acid (10%). The deproteinised samples (20 μl) obtained on centrifugation were treated with 50 μl of a mixture made of 250 mg O-phthalaldehyde and 250 μl β-mercaptoethanol in 6.3 ml methanol. After incubation at room temperature for 10 min, the samples were filtered through a 0.45 μm filter and an aliquot (10 μl) was injected into the HPLC reverse phase (C18) column and detected in the isocratic mode by using a fluorescence detector . The mobile phase consisted of acetonitrile and 0.04 M sodium acetate buffer, pH 5.4 (13.6: 86.4). Glutamine was eluted within 15 min and compared with a series of derivatised glutamine standards ranging in concentrations from 15–70 pmoles. Glutamine synthetase (L-glutamate ATP ammonia ligase, EC 6.3.1.2) activity in clarified chick brain supernatants (obtained as detailed above) was assayed according to the method described by Shapiro and Stadtman . The amounts of γ-glutamyl hydroxamate formed after 15 min at 37°C were measured (1 μmole of γ-glutamyl hydroxamate has an optical density 0.532 at 530 nm). The whole embryo as well as liver samples were weighed and homogenized separately in phosphate buffer (20 mM, pH 7.4). The homogenates were diluted (1:1) with the same buffer and centrifuged at 10,000 rpm. Using a semi-automated auto-analyser (BTR 820, Biosystems, Barcelona, Spain), supernatants obtained were used for various assays including cytosolic aspartate aminotransferase (AST, EC 2.6.1.1), alanine aminotransferase (ALT, EC 2.6.1.2) and lactate dehydrogenase (LDH, EC 1.1.1.27) enzymes, employing kinetic methods described below. a) AST catalyses the transamination of L-aspartate and α-ketoglutarate to L-glutamate and oxaloacetate. Subsequently malate dehydrogenase converts oxaloacetate to malate with oxidation of NADH to NAD that is accompanied by a decrease in the absorbance at 340 nm. The rate of decrease is proportional to the AST activity. b) ALT assay is similar to the AST assay except for the use of L-alanine as the substrate. The pyruvate formed is converted to L-lactate by lactate dehydrogenase while NADH is converted to NAD with a subsequent decrease in the absorbance at 340 nm. Lactate dehydrogenase catalyses the reduction of pyruvate to L-lactate with oxidation of NADH to NAD. Since the oxidation of NADH is directly proportional to the reduction of pyruvate in equimolar amounts, the activity of LDH was calculated from the decrease in absorbance at 340 nm at 37°C . Statistical analyses of the data were based on the Student's t-test using SigmaPlot (Version 5.00) statistical package. The level of tyrosine and norepinephrine on day 15 under different magnetic field intensities (5, 50 and 100 μT) are given in Figures 2, 3, 4, 5, 6 and 7. There was a significant decrease (p < 0.01) in the level of tyrosine content on day 15 for all magnetic field strengths tested as compared with the control group. Also, there was a significant increase (p < 0.01 and p < 0.001) in the level of norepinephrine on day 15 for the 5, 50 and 100 μT magnetic field intensities as compared with the control group. It was observed that magnetic field intensities (5, 50 and 100 μT) had no effect on the level of tyrosine and norepinephrine up to day 10 as compared with the control group. 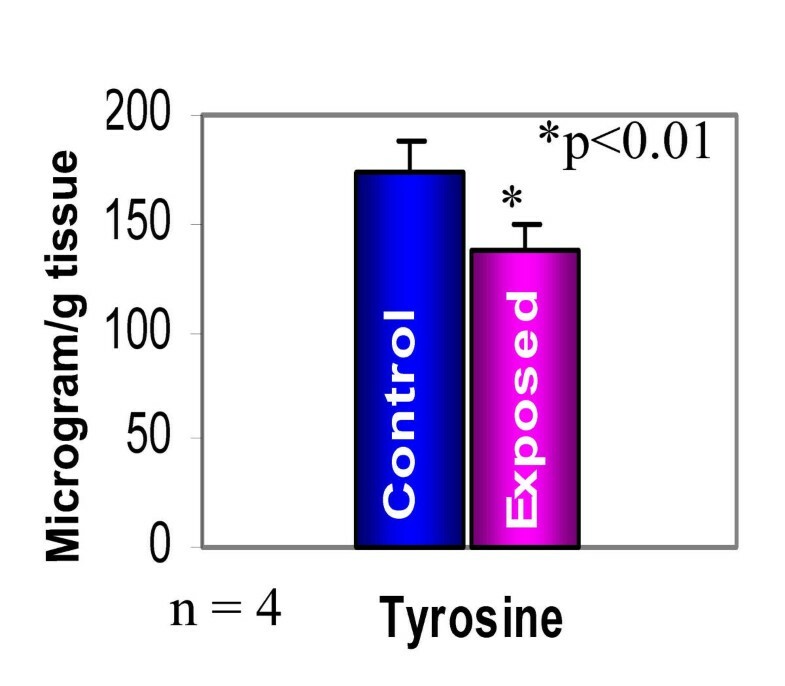 Similarly, none of the magnetic field intensities (5, 50 and 100 μT) had any effect on the level of tryptophan and 5-HT up to day 15 of the development of chick embryo. 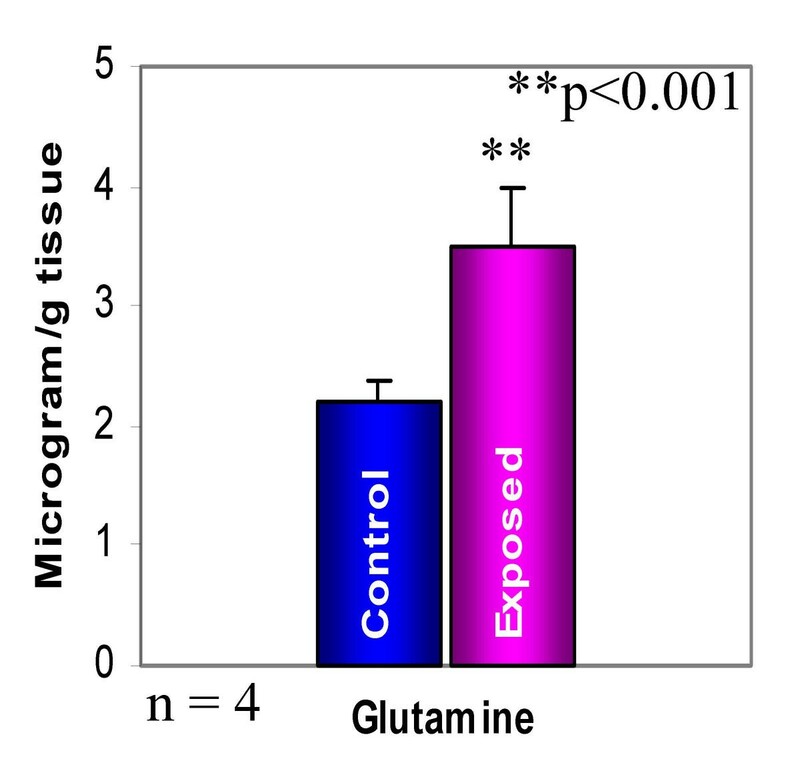 There was a significant increase in the glutamine level (p < 0.01) and glutamine synthetase activity (p < 0.001) for the 100 μT exposure on day 15, in comparison with the respective control group as given in Figures 8 and 9, whereas, there was no significant change in the glutamine level and glutamine synthetase activity between control and experimental group for the 100 μT exposure up to day 10. 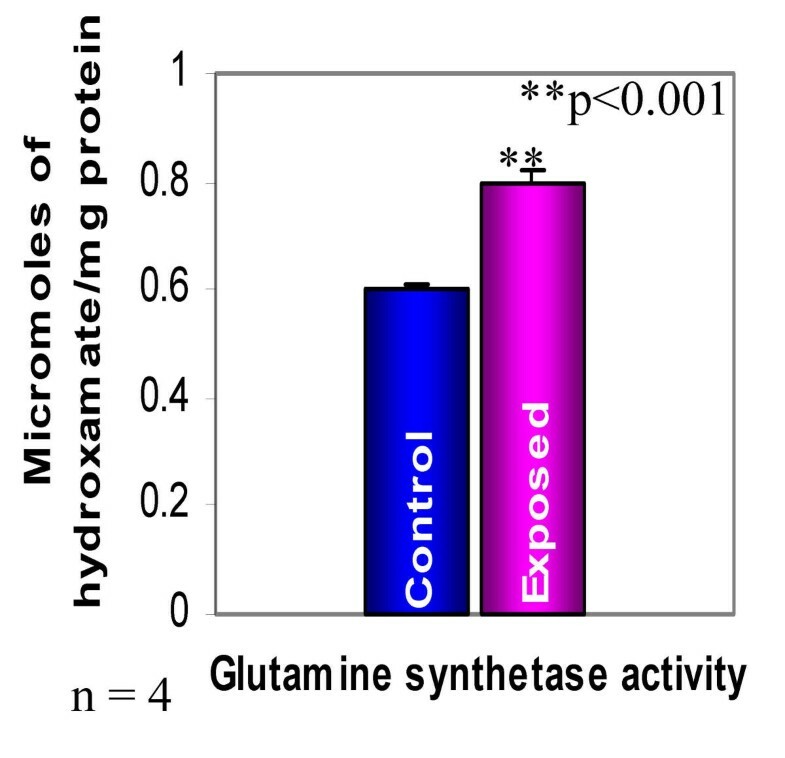 Further, we observed that there was no significant change in the glutamine level and glutamine synthetase activity between control and experimental group for the 5 or 50 μT exposure. The magnetic field intensities (5, 50 and 100 μT) had no effect on the activity of AST, ALT and LDH either in the liver or in the whole embryo up to day15 as compared with the control group. There are very few experimental studies on the effect of power frequency magnetic fields on the neurotransmitters and enzymes in developing embryo system [17, 18]. 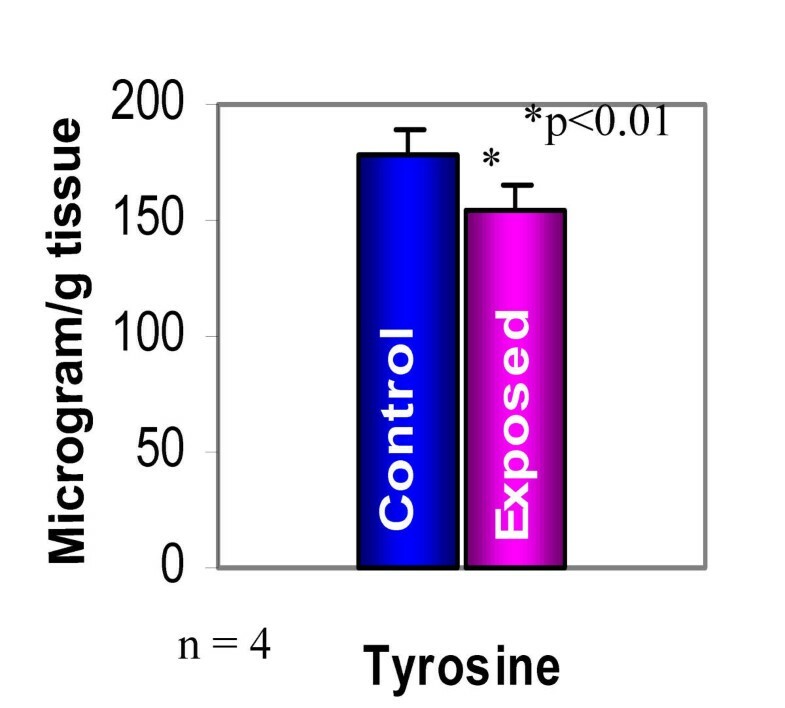 In the present investigation we have analyzed the level of norepinephrine and tyrosine (precursor for norepinephrine and epinephrine) along with 5-HT and tryptophan (precursor for 5-HT) in the brain of developing chick embryos exposed to one of several magnetic field intensities (5, 50 or 100 μT). Epinephrine, norepinephrine and dopamine are the major factors in response to severe stress . These bioactive amines (dopamine, epinephrine and norepinephrine) are synthesized in the chromaffin cells of the adrenal medulla from tyrosine precursor. Collections of these cells are also found in the heart, liver, kidney, gonads, and adrenergic neurons of the post ganglion, sympathetic system and central nervous system. These amines have dual role acting as neurotransmitters and hormones. The stress response involves an acute, integrated adjustment of many complex organ processes (brain, muscles, cardiopulmonary system and liver) at the expense of other organs that are less immediately involved (skin, gastrointestinal system and lymphoid tissue). Many aspects of behavior and physiology such as eating, sleeping, body temperature and oxygen consumption, show a daily (circadian) rhythm which can be linked to changes in neurochemicals and which continue to persist, often with a longer period, even in the absence of external time cues such as light/dark cycle. There is evidence that chronic exposure to 60 Hz electric field can modulate specific circadian rhythms in primates exposed to 26 to 39 kV m-1 in the absence of time cues . These changes have been linked to concomitant field-induced changes in pineal activity, particularly a reduced production of melatonin. However, more recent studies on the effect of exposure to ELF electric or magnetic fields on the other hormones levels, including those of stress hormones (corticosterones in rodents, cortisol in primates), in which care has been taken to eliminate confounding factors, report no effects of ELF EMF on these hormone levels . Even though some reports indicate suppression in the level of melatonin due to magnetic field , other reports indicate absence of suppression of melatonin . We have found a significant increase in the level of norepinephrine in the developing chick brain on day 15 following exposure to 5, 50 or 100 μT magnetic fields. 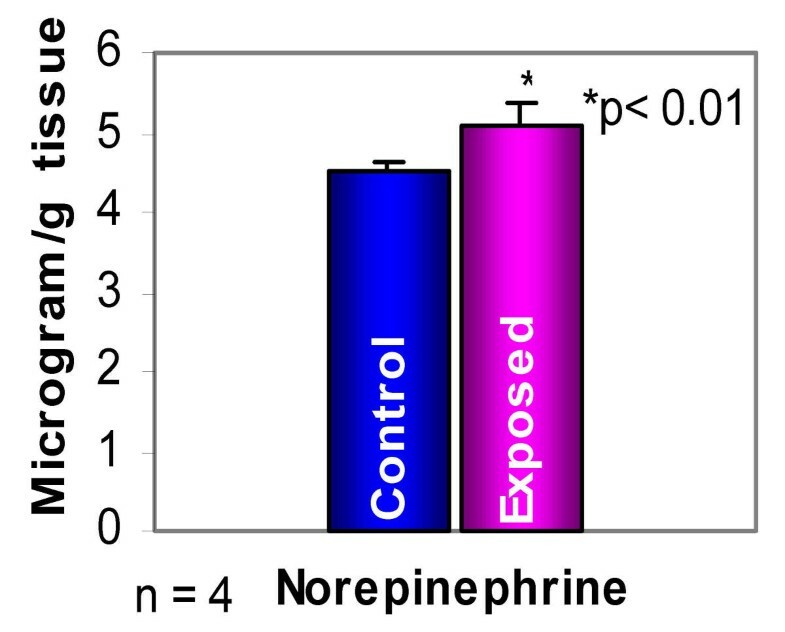 The increase in norepinephrine levels is further supported by a significant decrease in the tyrosine pool, a precursor amino acid for norepinephrine. Norepinephrine is associated with higher levels of emotional arousal. The center of norepinephrine functioning is the locus coeruleus in the brain stem. 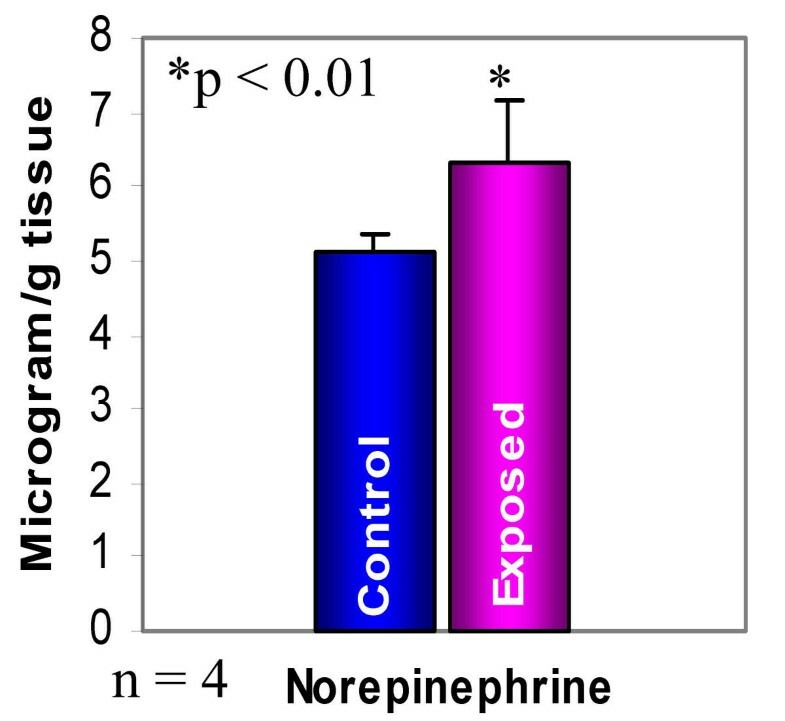 Norepinephrine release affects distant neurons in a manner similar to that of an aerosol spray. When norepinephrine activity is high, there is increased activity in the limbic system and decreased activity in the cerebral cortex resulting in performance anxiety . This type of anxiety may affect the circadian rhythm and also may induce restlessness. Especially, in the case of birds, pineal gland activity is found to be altered under the influence of magnetic field leading to migratory restlessness . The lack of appreciable amount of iron in the pineal gland [26, 27] of birds makes it an unlikely target as is the magnetite required for transducing magnetic stimuli in the bacteria . This suggests that the alterations in the levels of norepinephrine induced by magnetic field may influence the activity of pineal gland, which is involved in the production of melatonin. However, we have not observed any alterations in the level of tryptophan (precursor amino acid for melatonin) or 5-HT in the brain under magnetic field stress. The mechanism of increase in the level of norepinephrine can be speculated based on the regulation of the enzyme dopamine beta hydroxylase (DBH), which converts dopamine to norepinephrine. The DBH requires two copper atoms per subunit for its activity . Copper is a paramagnetic metal and its role in the activity of DBH may be altered by the external magnetic fields. As supportive evidence, a recent study has shown that the ion-protein complexes can rotate under static magnetic fields . 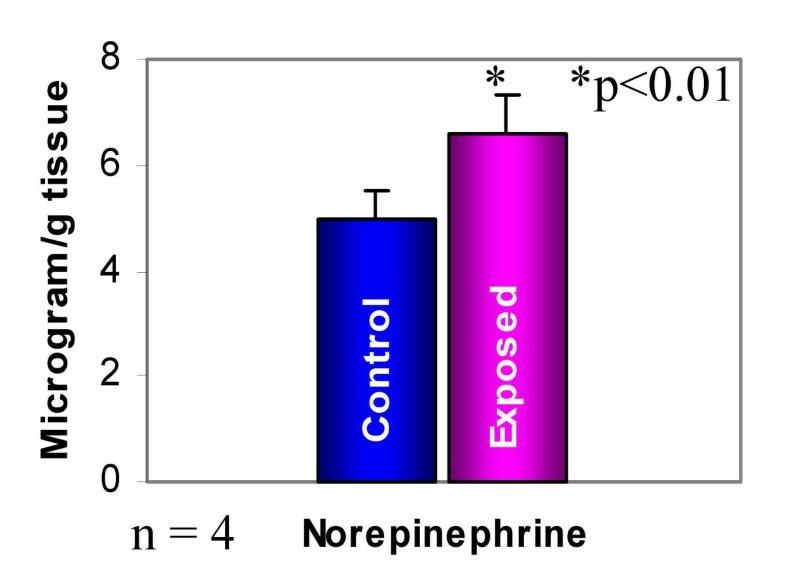 Hence, the increased level of norepinephrine indicates a possibility of increased DBH activity. Further studies are warranted to prove this aspect. The predominant amino acids present in the brain of most species are glutamate, glutamine, aspartate, N-acetyl aspartate and GABA (gamma aminobutyric acid), constituting more than 60% of the free amino nitrogen. Glutamate and its related amino acids are present in highest concentrations both in brain tissue as well as in the spinal cord but not in peripheral nerves . Brain tissue is also extremely sensitive to ammonia, which is immediately detoxified to glutamine by glutamine synthetase, present in the endoplasmic reticulum. Glutamine is an important neurotransmitter synthesized in the brain by GS through incorporation of an ammonium ion into glutamate. Glutamine stimulates the release of human growth hormone and it is the rate-limiting factor for muscle growth. The present study indicates a significant increase in the level of glutamine in the brain on day 15 (100 μT) in comparison with the control. Hence, this may be a contributing factor for the developmental abnormalities observed in the chick embryo [2, 7]. However, we did not find any significant change in the morphology of the developing chick embryo in comparison with the control up to 100 μT. The finding of an increase in the level of glutamine in the brain is further supported by the enhanced activity of glutamine synthetase. As in the case of copper, present in the DBH, manganese is essential for glutamine synthetase activity. Also, manganese is dynamically coupled to the electrophysiological activity of the neurons . Since manganese is a paramagnetic metal atom, it can be influenced by the external magnetic field, leading to the enhanced activity of glutamine synthetase. The speculation warrants further study on this aspect. The enhanced activity of glutamine synthetase decreases the glutamate pool in the brain leading to the decreased synthesis of GABA, which is produced from glutamate through decarboxylation. GABA is an important inhibitory neurotransmitter present in the brain. In order to assess the toxicological changes due to magnetic fields on the developing chick embryo we have analyzed the specific activities of aminotransferases (AST, ALT) and lactate dehydrogenase in the whole body as well as in the liver. Magnetic field exposures appear to have had no effect on these parameters suggesting that there is no direct toxic effect of ELF EMF exposure (up to100 μT) on the liver or whole body in the developing chick embryo. Our present study on the effect of ELF EMF on developing chick embryo reveals that by day 15, there is a significant increase in the level of norepinephrine in the brain for 5, 50 or 100 μT magnetic field strengths (fully differentiated embryo), while there was a decrease in the tyrosine content. This could explain findings of EMF-induced changes in circadian rhythm. Also, there was significant increase in glutamine synthetase activity accompanied by increased amount of glutamine content in the brain by day 15 for the 100 μT field strength. This may influence the developmental changes in the chick embryo previously observed with exposure to magnetic fields. However, there were no significant changes in the aminotransferases and lactate dehydrogenase under the influence of magnetic fields. We acknowledge Dr. R. S. Shivakumara Aradhya for his help in establishing the magnetic field exposure set up. Central Power Research Institute, Ministry of Power, Govt. of India is duly acknowledged for providing funds (Contract grant No.11.1.14) and Junior Research Fellowship to Mr. P. Rajendra. PR carried out neurochemical analysis and drafted the manuscript. HNS carried out the toxicological enzyme studies and statistical analysis. DD carried out the designing of magnetic field exposure facility. BG participated in the calibration of magnetic field exposure facility. RBS and CS are the chief investigators who conceived the study and participated in its design and coordination. C has given expert comment on the electrical aspects of the study.